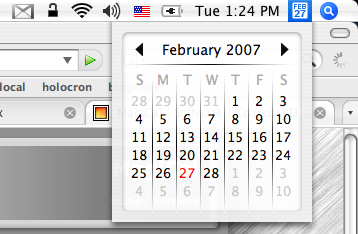 Thanks to Magical, now I don’t have to open iCal or go to the dashboard to get a decent calendar. Found this via AppleMatters. This was written by Anshul. Posted on Tuesday, February 27, 2007, at 1:31 pm. Filed under mac. Bookmark the permalink. Follow comments here with the RSS feed. Post a comment or leave a trackback.